STOCKHOLM, Sweden — Around 300 neo-Nazis demonstrated in central Stockholm on Saturday, drawing boos from counter-protesters and politicians. 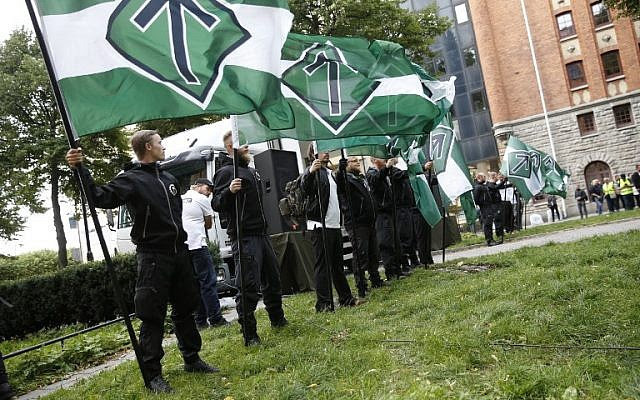 Under the close watch of a detachment of police in riot gear, members the Nordic Resistance Movement (NRM), an anti-European Union, anti-gay, and anti-immigration group, gathered in Kungsholmstorg square in the Swedish capital. The movement had applied for permission to host a rally for some 3,000 members, far more than the several hundred the event drew, according to Swedish broadcaster SVT. Among the protesters was Swedish Culture Minister Alice Bah Kuhnke, who was born to a Gambian father and a Swedish mother. The rally took place ahead of Sweden’s September 9 general election, in which immigration is a key issue. NRM, which was founded in 1997, is a political party which openly promotes a racist and anti-Semitic doctrine and has been described as the country’s most violent Nazi organization by Swedish anti-racism magazine Expo. For the first time in its 21-year history, the NRM will present a list of 24 candidates to run in the elections, although the party is unlikely to pass the 4.0 percent threshold to enter parliament. One of its candidates is facing a police investigation for raising a flag on April 20 in honor of Adolf Hitler’s birthday. 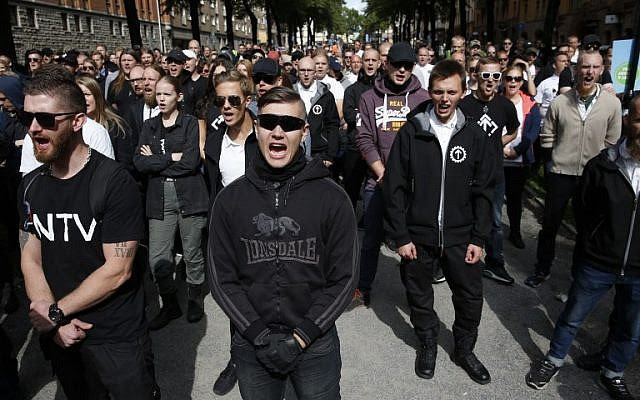 Writing on Facebook on Saturday, Swedish Prime Minister Stefan Lofven said he wanted to ban neo-Nazi organizations. “Democracy has always had the right to protect itself from the forces willing to resort to violence to destroy it,” he said.